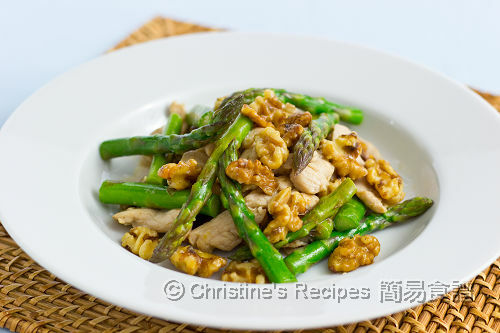 Ever tried stir frying asparagus with walnuts? The crunchiness of walnuts and crisp asparagus stems are so enjoyable. Asparagus is regarded as a classy vegetable and you have to pay more than other vegetables in restaurants. Lucky me, I’d find some fresh asparagus, available at a bargain price in supermarkets every now and then through out the year. When it comes to cooking asparagus, it is easy and quick. They taste great no matter they’re steamed, baked or boiled. The crisp stems with natural sweetness are most enjoyable. 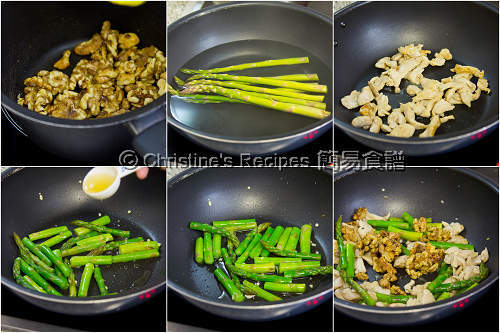 In Chinese cooking, we like to stir fry asparagus with garlic, sometimes with our favourite meat. 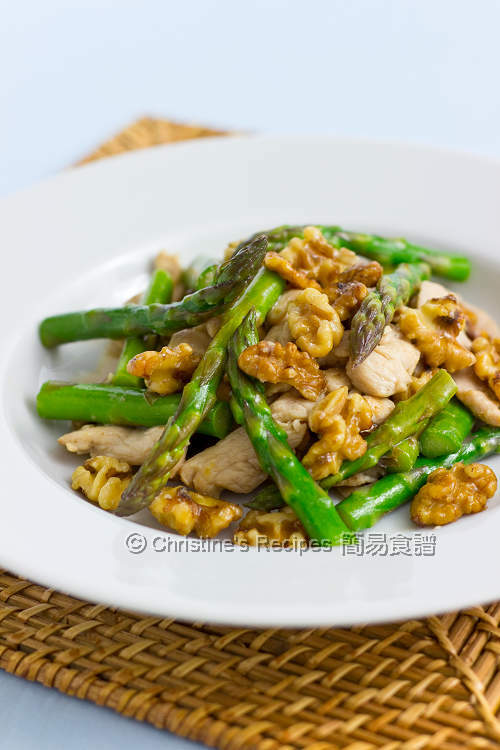 Recently, I found asparagus goes really well with walnuts. Give it a try if you’d like to experiment with a variety of asparagus recipes. Heat walnuts in a small pan without any oil over medium heat until aromatic. Remove from the heat. Let them cool down. Mix chicken with marinade. Set aside. Heat oil in a wok or a frying pan. Cook the chicken over high medium heat until chicken turns white and cooked through. Set aside. Blanch asparagus in boiling water for about 2 minutes. Drain well and immediately soak in cold water until cold to touch. Drain well again. Cut them into 3 to 4 sections. Stir fry in the same pan with a little of oil. Add garlic and saute until aromatic. Season with salt and sprinkle wine. Quickly stir to combine well. Pour chicken stock and fish sauce. Cook further for another 2 minutes. Toss back the chicken and quickly combine well. Turn off the heat. Stir in the walnuts. Serve immediately. By soaking the blanched asparagus in cold water, you can keep its fresh green colour. To get the best results, briefly stir fry the thicker stems first, then add the thinner ones and cook together. Don't overcook the asparagus because you'd like to enjoy the crisp stems. You might replace with your favourite meat or just skip the meat if you feel like a vegan dish. Never tried stir-fry walnuts before. This will pair well with rice. Thanks for sharing! Thanks for sharing this recipe. It came out really well. The only change I made was to switch the walnuts with cashews. BTW, great book. My friend brought it back from HK. Too bad they're not sold locally in the US. Yeah, both walnuts and cashew work really well for stir fry with chicken. Thank you for sharing this stir fry recipe. I really loved it because I like all the vegetables. I will encourage my sister to cook this recipe for tonight. Thank you for sharing this. Our family loves it. Especially my husband. So glad that you and your husband loved this recipe. will translate and post the recipe of ginger and scallion crab later. Thanks for your patience. looks so easy and tasty..is it possible to replace the wine? You might replace Shaoxing wine with white cooking wine or dry sherry. Thanks for the recipes and tips of cooking asparagus. Today is the first time i bought 2 bunch of asparagus on sale in Coles. I stir fried with shrimps/baby prawns with red chillies onion, garlic & couple dash of oyster and sri racha sauce. Since i have never cooked this before, i sort of overcooked the asparagus. Anyway ,going to buy more asparagus tomorrow and will try your version. Btw how long can i store the asparagus? Also, is your book avail in any bookstore in Australia, since you are residing here? Many thks. Asparagus can be kept for a few days in fridge. Yeah, don't over cook them as you won't like them losing their crunchiness. As for my cookbook, you might try get it from ebay here.